Windows 10 is the new version of Windows from Microsoft. It is an excellent new version of Windows. A lot of negative things have been written about Windows 10, and a lot of people have been hesitant to upgrade. A lot of this is misinformation, and some of it is because some of the default settings in Windows 10 are bad. In this post, I will tell you the most important settings to change to improve the privacy of Windows 10, and how to set it up to handle updates properly. I have been using Windows 10 since last October when I purchased a new Windows 10 computer (see my Intel NUC review of this great machine). Before that I had a Windows Insider build as well, so I have been using Windows 10 for some time now. 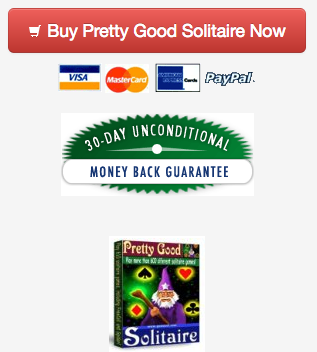 The latest version 16 of Pretty Good Solitaire was developed on Windows 10. Prior to this version, I was still developing in Windows XP (although of course I had later versions of Windows as well, I just preferred to develop on Windows XP). Windows 10 is clearly the best version of Windows since XP. While Windows 7 was good, Windows 10 is better. It is just that Microsoft made some bad choices on a number of default settings, probably because they are giving away the upgrade for free and therefore felt they could get away with some things they probably wouldn't have otherwise. Let's begin with some privacy settings. Begin by clicking on the Start button, select Settings, select Privacy. In the General section, turn "Let apps use my advertising ID for experiences across apps" off. I just don't know why you would ever want this one on. Then turn off "Send Microsoft info about how I write to help us improve typing and writing in the future". Let Microsoft figure out how to write without your help. You can also turn off "Let websites provide locally relevant content by accessing my language list", although I don't think this one is particularly important. In the "Speech, inking, & typing" area, click "Stop getting to know me" if it shows that, so that Cortana won't be logging everything you do in order to "get to know you". Of course if you use Cortana, you might not want to do this one. Cortana is really no different from Siri, Hey Google, or Alexa when it comes to privacy, but if you don't use Cortana, make sure you stop this. In the Feedback & Diagnostics area, set "Send your device data to Microsoft" to Basic. This will reduce Microsoft's telemetry down to a minimum. Finally, go back to Settings, choose Network & Internet, Wifi, Manage Wifi Settings. Turn off "Wifi Sense" by turning "Connect to suggested open hotspots" and "Connect to networks shared by my contacts" off. OK, now we have taken care of the basic privacy settings. One of the big issues with Windows 10 is the automatic updates. But there is a very easy way to stop them. Go to Start, Settings, Updates & Security, Windows Update, and click on Advanced Options. Set "Choose How Updates are Installed" to "Notify to schedule restart". This will stop Windows 10 from just updating whenever it feels like it and give you a chance to decide when it should do it. Next, to fully stop the automated updates, go back to Settings, select Network & Internet, Wifi, click on Advanced Options. Under "Metered Connection", set it to on. This will stop Windows 10 from automatically downloading updates. Unfortunately, this only works for Wifi connections and not ethernet connections. But with this setting, Windows 10 won't automatically download an update, it will wait for you to tell it to. You will need to check every few days for updates, but you can do it on your schedule and not whenever Windows does it. It is important to always check, especially for Windows Defender updates, as you want to get these updates installed fairly quickly. But again, with these settings Windows will not interrupt you with updates, it will only do it when you tell it to. Finally, to help you remember to check for updates often, go to Start, Settings, Updates & Security, Windows Update. Right click on Windows Update on the top of the left column, then select "Pin to Start". This will create a tile on the start menu for Windows updates, so you can go directly to them. This makes it easy to check for updates and serves as a reminder when you go to the start menu that you need to do updates occasionally. If you are on Windows 7 or 8, I highly recommend updating to Windows 10 if you can. There is no doubt it is a better Windows. And if you make these changes to the default settings, you get rid of the privacy and annoying update interruptions that are Windows 10 main flaw. Windows 10 is the future, and the sooner you move to it, the sooner you will get used to it. 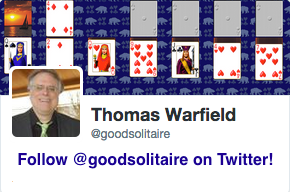 And, of course, Pretty Good Solitaire works great on Windows 10. "to fully stop the automated updates, go back to Settings, select Network & Internet, Wifi, click on Advanced Options"
It looks all the Windows 10. Thanks for the help with Windows 10. Scary all the things I had ON that needed to be turned OFF. Ever since I downloaded the present version of goodsol I have been experiencing a very slow exit from a hand that I have solved. The cards go one by one (about every second) to the pile (sorry, I'm not one who has memorized your terms for the various stacks of cards) by which I mean the cards at the top of the screen. Once there are no cards left in the waste pile the screen freezes (except for the mouse circle) and then, after about 1 second per card, the new game page comes up. In previous versions, as soon as I have solved the hand, zip, the new game page is up. I have been playing your solitaire games for many years--even before windows xp--and love "big harp". I hardly ever use any of the other games. We all appreciate the information in your blog. Thanks. As a 75 year old man new to Windows 10 (formerly Windows XP) I have had a lot to learn. It has been like the jump from modem to cable to wifi. Privacy issues have exploded during the years from XP to 10 and I have never gotten my arms around them. Your instructions have allowed me to begin this process. The other new privacy issue regards the little chip on my credit cards! Got any suggestions about that one? Jim, that setting works only for Wifi, not ethernet, so that was probably the problem. Don, click on the Options button on the main screen, set the "AutoPlay Animation Speed" setting to the highest level. I am stuck in Freecell game #178, does anyone know if it is unsolvable?